Join Us for the SandHill Review Launch Party on May 3rd! You are invited to the SandHill Review Launch Party May 3rd, 2019 at 6:00 PM McDaniel Hall Room 101 -Food will be served- The event will include live presentations of works from the SandHill Review Come help us celebrate student, staff, and alumni works! 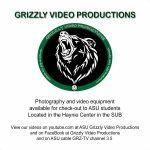 Come Check Out what the Grizzly Video Productions has to Offer!